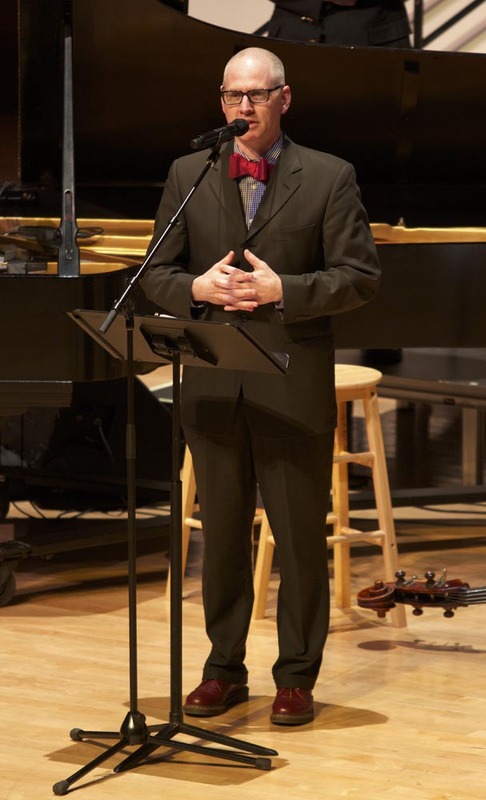 When you see a lot of live music, you experience a lot of world premieres. 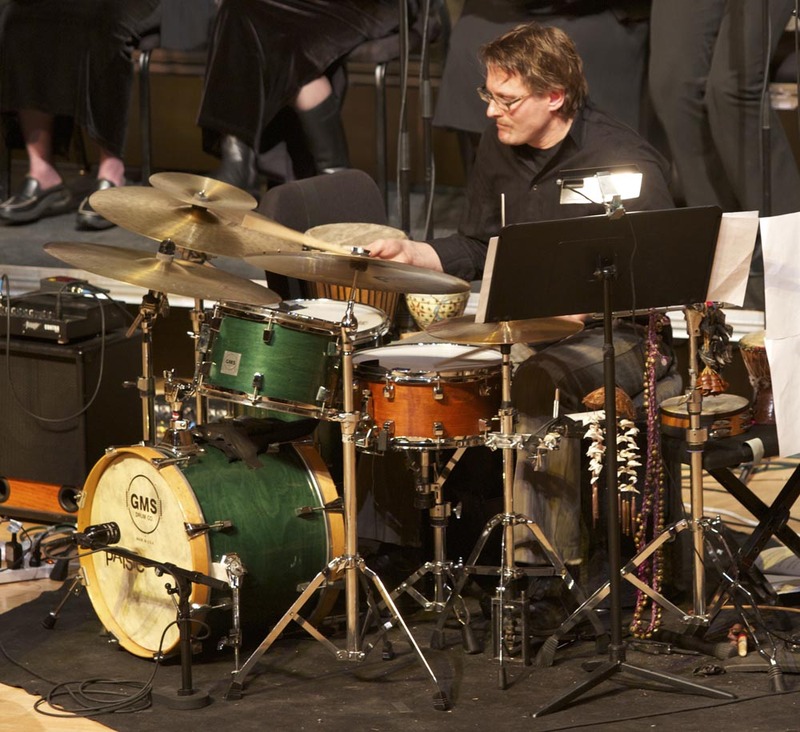 With jazz and improvised music, every performance is a world premiere. You learn to expect the singular and evanescent. You develop a taste for the new. 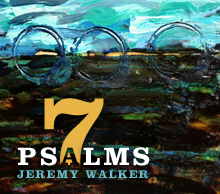 Even though I had talked with composer and pianist Jeremy Walker about his latest work, heard some of the music, and glanced through parts of the score, I wasn’t prepared for the power, scope, and enormity of “7 Psalms,” which had its world premiere at Bethel University last night before a crowd estimated at 600 people. 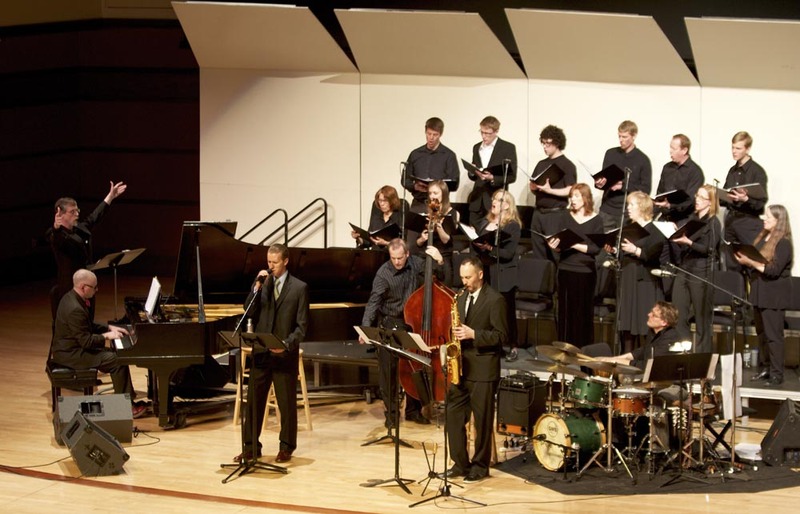 With Brandon Wozniak on tenor saxophone, Jeff Brueske on bass, and Tim Zhorne on drums, vocal soloist Jason Harms, and a choir led by Brian Link, Walker poured out his heart and soul, intelligence and commitment in a piece that lasted almost 90 minutes. It was sad and uplifting, stormy and hushed. It marched and it swung. It was requiem and hosanna, blues and hymn. And it was a miracle — in part because of the personal challenges with which Walker has been dealing the past 15 years (he was recently diagnosed with Lyme disease; you can read more about that here and here), in part because of what he chose to do in creating this piece. These are not singable words and phrases. (“Iniquity”? "Potsherd”? "Affliction of the afflicted"?) There’s no rhyme, rhythm, form, or meter. No verses or choruses; nothing that repeats except the phrase “O Lord.” Some stanzas have four lines, some six, some five, some eight. There are none of the usual elements that make a song. As a composer, where do you start with this? It must have been tempting to trim, to revise, to skip a verse here and there, but that’s not what Walker did. He saw composing for these words as an artistic challenge. Could he leave the language intact and fit the music to the words? And make the music work? When he read the psalms, he heard music in his head. Could he get it out, turn it into something a soloist could manage, split it into SATB for a choir? He could and he did. It must have been a bit like making the Constitution singable. Walker's thinking about turning to Whitman next, or Lord Byron. Either might be a walk in the park after "7 Psalms." Overall, last night was a success. Parts of the music are still running through my head. Psalm 22 had a lengthy improvised section that could have been shorter; the psalm itself is wordy and the language is dense, so less might be more. The 13-voice choir had a lot to do, which doesn’t always happen when jazz musicians write for choirs. They sang in every psalm, and Psalm 13 was all theirs. The original plan called for a 20-voice choir; as performance night approached, some people dropped out due to illness, too late to find and rehearse replacements. More voices would be better. Last night's choir sounded a bit thin. Walker’s piano playing was confident and strong. 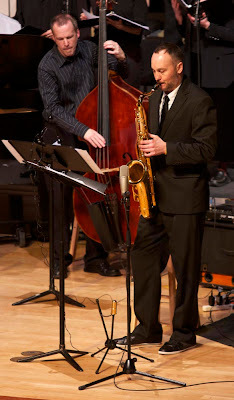 Jeff Brueske and Tim Zhorne, the two members of his core trio, were with him all the way. 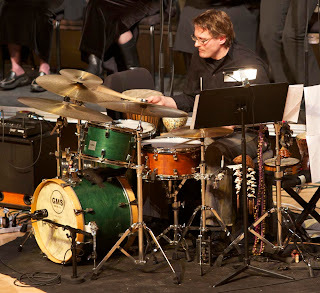 Brandon Wozniak did what he always does, playing beautifully as part of the ensemble and soaring on his solos (he received the only spontaneous applause of the night). Last night was the birth of a work for which Walker has big plans: going into the studio to record a CD (for which people are already asking) and taking “7 Psalms” out into the world, connecting the soloist and instrumentalists with other choirs in communities, colleges, universities, and churches. Those who wish to contribute have until midnight Monday, April 15. Concert's over. 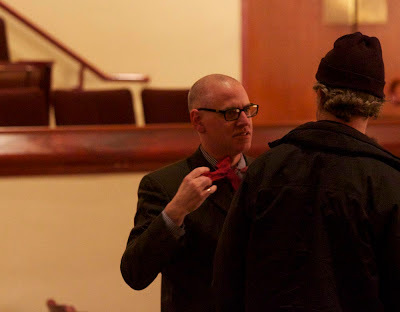 Off with the bow tie.